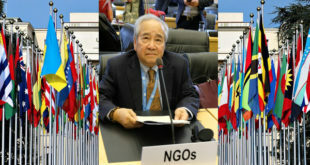 On behalf of the Vietnam Committee on Human Rights, a member organization of the FIDH, I would like to comment on a number of Vietnam’s replies to the CESCR’s list of issues. On the implementation of the Covenant (Question 1), Vietnam cites a string of laws to show that rights guaranteed in the Covenant are incorporated into domestic legislation. In reality, Vietnam’s laws contain provisions that restrict or even nullify the rights enshrined in the ICESCR. Many newly-amended laws are even more restrictive before. The Constitution, amended in 2013, imposes new restrictions on the exercise of human rights (Article 14.2). The new Law on Trade Unions (2013) is a real step backward for worker rights, as it prohibits foreigners from establishing or joining trade unions, which was allowed under the previous law. The Land Law (2013) contains numerous loop-holes which are exploited by corrupt local officials to dispossess farmers of their lands. 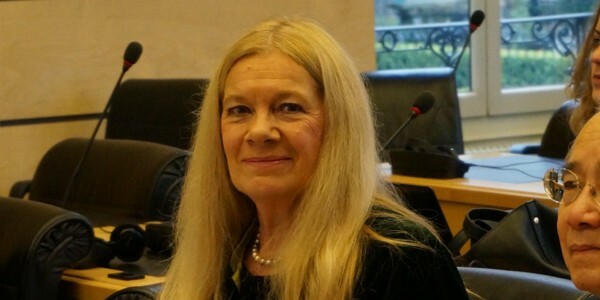 If the Vietnamese Courts have never directly invoked or applied the ICESCR, it is because the judiciary invokes spurious provisions in the Penal Code on “abusing democratic freedoms” (article 258) “undermining national solidarity” (Article 87) or “spreading anti-State propaganda” (Article 88) to imprison citizens, in gross violation of the Covenant. 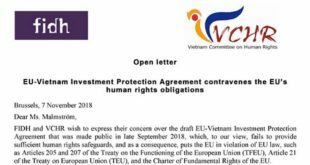 Indeed, for ordinary Vietnamese citizens, Vietnam’s accession to the ICESCR is no guarantee against abuses of their economic, social and cultural rights. Regarding corruption (Question 4, Par.13), Vietnam states that people who denounce corruption are protected by law. In fact, they face harassments and imprisonment. Hoang Khuong, a journalist on the official newspaper Tuoi Tre wrote a series of articles in 2012 revealing corruption among traffic Police. Although his articles proved to be true and led to the conviction of one policeman, he was fired from his job and sentenced to 4 years in prison. Non-Discrimination (Question 6): Despite the constitutional guarantees cited by Vietnam, discrimination on the grounds of religion, political opinion or ethnicity is endemic. Members of “non-recognized” religious groups such as the Unified Buddhist Church of Vietnam, ethnic minorities, bloggers, dissidents and human rights defenders suffer harassments, intimidation and imprisonment. Discrimination in access to health care, employment and education is perpetuated by the “ho khau”, or obligatory residence permit, which records one’s religion and ethnicity. Trade Union Rights in Vietnam (Question 15) are totally incompatible with the ICESCR because workers cannot join unions of there choice. There are no independent trade unions in Vietnam. The official Vietnam General Confederation of Labour (VGCL), which functions under Communist Party control, does not take the workers’ side in disputes. Not one strike was organized by the VGCL last year. Workers who engage in “wildcat” strikes not only risk legal sanctions, but are also liable to pay three months’ salary in compensation to their employers under recent legislation. The Land Law (Question 22) does not protect farmers from forced evictions and State confiscation of lands. Official corruption, power abuse and lack of mechanisms to assess the market value of lands has led to virtual State land grabbing. Recent protests in Van Giang, Con Dau, Vu Ban and Duong Noi have been violently suppressed by Police. The Internet (Question 28, par. 83) is subjected to draconian controls and restrictions, notably under Internet Decree 72. 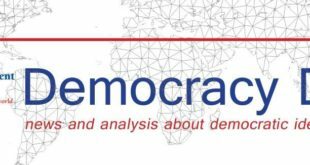 Scores of bloggers are serving harsh prison sentences for denouncing abuses of political and economic rights, and arrests continue. 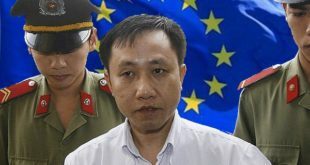 Prominent blogger Nguyen Huu Vinh (AnhBaSam), arrested in May 2014 on charges of “abusing democratic rights” faces up to 7 years in prison. Blogs and websites in Vietnam denouncing economic and social rights abuses have been hacked, banned, or forced to operate outside the country. 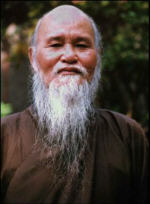 Suppressing criticisms of human rights violations will not achieve human rights progress in Vietnam. We urge the Committee to press Vietnam to release all human rights defenders detained for their advocacy of economic, social and cultural rights; repeal all laws that restrict the exercise of economic, social and cultural rights; and dismantle the mechanism of the “ho khau” which perpetuates discrimination on the grounds of religion, political opinion, ethnic origin, status and birth.